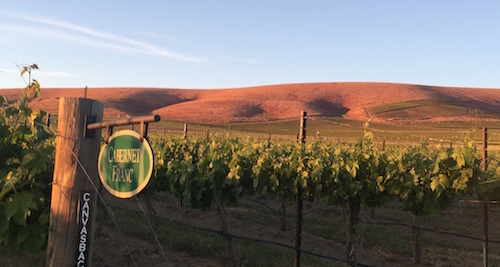 A question often asked by lovers of Northwest wine is how Red Mountain got its name. After all, it’s not much of a mountain, and it’s brown. In fact, the nearby town of Kiona is a native word for “brown hills,” which appropriately describes the nearby Rattlesnake and Horse Heaven hills. But “Brown Hill” isn’t nearly as marketable a name as Red Mountain. From a wine perspective, there are plenty of other reasons for the name. For example, of the 2,338 acres of wine grapes planted on the 4,000-acre area, red varieties dominate, leading with Cabernet Sauvignon taking up more than half of the acreage. Red Mountain is the one of warmest growing regions in the Columbia Valley and receives a scant six inches of precipitation annually. The real reason behind the name makes itself apparent. Each May, the cheatgrass that grows on the hill turns red hue for a few weeks each year. While late spring is the right time to visit Red Mountain to see it when it red, any time is appropriate taste a some award-winning red wines. Here are some Red Mountain wines we’ve tasted in recent weeks. Ask for them at your favorite wine shop or contact the winery directly.